Coconut oil obtained from coconut milk is called virgin coconut oil. 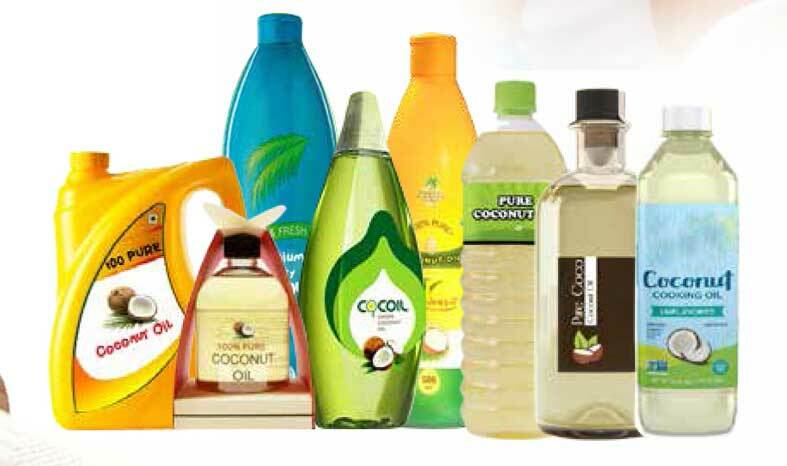 Traditional and modern methods are available for the manufacture of virgin coconut oil. In the traditional method, milk extracted from grated coconut kernel is boiled to get oil. Of late, the traditional method has been partially mechanized using a bridge press and mechanical grater. The modern method of extracting oil from fresh coconut kernel is known as wet processing. The Virgin coconut oil is considered superior for use as edible oil, hair oil and baby oil because of its pleasing aroma and purity. It is applied on the body of babies to protect from skin diseases. Because of its low FFA content, this oil has a longer shelf life. Dehydrated coconut meat in the grated and shredded form is desiccated coconut (DC). A large number of units in India are manufacturing DC which is mainly absorbed by the confectionery and other food industries. DC is also used as a substitute to grated coconut in various household preparations. DC is available in different grades based on the fineness of the material. Coconut Milk is the oil-protein-water emulsion obtained by squeezing fresh grated coconut kernel. The undiluted and diluted forms are called coconut milk and the concentrated form is coconut cream. Coconut milk is obtained by extraction of fresh coconut wet gratings with or without water. This is an instant product, which can either be used directly/diluted with water to make various preparations such as fi sh & meat dishes, curries, sweets, deserts, puddings, cocktails, cakes, cookies, coconut jam, ice creams etc. It can also be used in the manufacture of bakery products and for coconut milk fl avouring food stuffs. Preserved forms of coconut milk such as canned cream or milk and dehydrated whole milk are now available in many coconut growing countries. 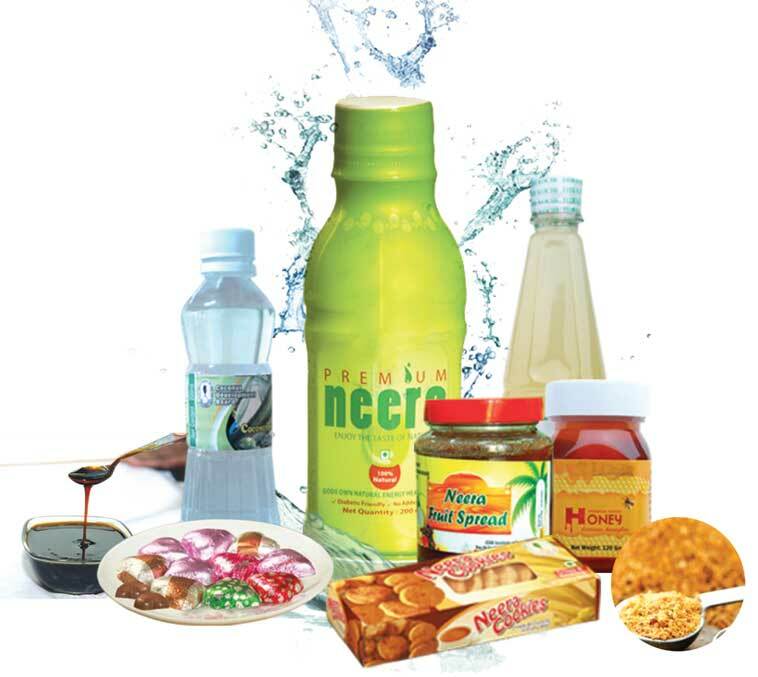 Commercial production of these products has been promoted in the Philippines, Thailand, Indonesia, Western Samoa, Sri Lanka and Malaysia and to some extent in India. Indonesia is the leading exporter of coconut milk followed by Sri Lanka, Thailand and Philippines. plant protein and is an invaluable material for the preparation of milk substitutes. Coconut skimmed milk is a solution of the soluble components of coconut after the cream is separated in a cream separator. Skimmed milk is a good source of quality protein suitable for the preparation of many useful food products or as supplemental protein source, especially in regions deficient in animal proteins. Freshly prepared coconut milk from pared kernel is filtered through a 120 mesh vibrating screen and the pH of the filtered milk is raised from 6.3 to 7.0 with the additions of sodium hydroxide. The milk is then pasteurized at about 60oC for one hour and subsequently centrifuged in a cream separator to yield the aqueous phase or the protein rich skimmed milk. Spray drying is the best method for the preservation of coconut milk. Spray dried coconut milk powder is reconstituted into coconut milk by adding water which can be used to make various food preparations. The product offers additional advantages such as less storage space, bulk packaging at reduced cost and longer shelf life. 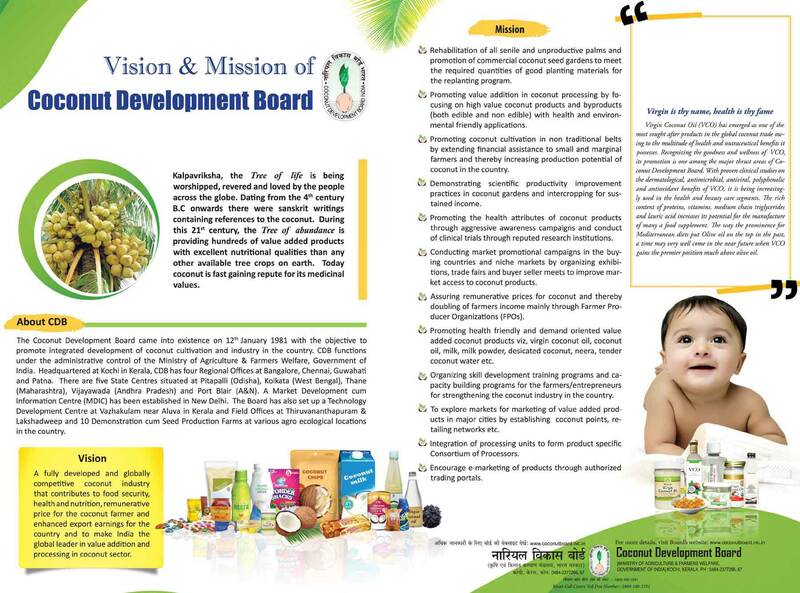 Technology for the manufacture of spray dried coconut milk powder is available with the Coconut Development Board. Processed and packed coconut cream is a ready-touse product which can either be used directly or diluted with water in various edible preparations. Coconut cream when partially defatted is called coconut milk. Coconut cream/ milk is used as an ingredient in household recipes and as a component of processed foods. Coconut milk is also used as coconut cream, a mixer in alcoholic drinks. Coconut milk/cream is available in pouches, bottles and tetra packs. Technology for the manufacture of coconut cream is available with Coconut Development Board. Coconut chips are a ready-to-eat snack food. It is prepared in salted and sweetened forms. The Central Plantation Crops Research Institute, Kasaragod has standardized the process for preparation of chips. Coconuts of 9-10 months are used for the preparation of chips. Coconut oil is rather a unique cooking oil as it contains the short and the medium chain saturated fatty acids. It fi nds extensive use in the food industry due to its characteristics such as easy melting behaviour, resistance to oxidative rancidity, pleasing fl avour and good digestibility. Coconut oil has gained importance as a dietary fat because of its high content of lauric acid, the source of monolaurin in the body and 16W content of Omega 6. It can be used for manufacturing margarine and shortenings. Coconut oil is preferred as a fat in the preparation of fi lled milk, infant milk powder, ice-cream and confectionery and bakery products. Because of its stable character, coconut oil is the preferred fat for deep frying. A large number of branded coconut oil in consumer packs are marketed in the country. Coconut oil is refi ned for industrial use. The refi ned coconut oil is water white in colour with no aroma. Since coconut oil has the lowest level of unsaturated fatty acids among all vegetable oils, the cost of hydrogenation is much less than all other oils. Two types of copra, namely the milling and the edible, are made in India. The milling copra is used to extract oil while the edible copra is consumed as a dry fruit. Edible copra is made in the forms of balls and cups. Copra contains the highest percentage of oil compared to other oil seeds. It contains 15-20 percent carbohydrates, 9 percent protein and 4.10 percent crude fi bre besides 65-68 percent fat. The carbohydrate fraction consists of a large percentage of cellulose and sucrose together with other sugars. Besides glucose and fructose the presence of galactose, raffi nose and pentoses is also reported. The water of tender coconut (TCW) is a sterile, nutritious and thirst quenching health drink. It possesses therapeutic properties. The TCW has a calorifi c value of 17.4 per 100gm. TCW is rich in potassium and other minerals. Sugars form an important constituent of the TCW. The concentration of sugars in the nut water steadily increases from about 1.5 per cent to 5-5.5 per cent in the early months of maturation and then slowly falls reaching about 2 per cent at the stage of the full maturity of the nut. Coconut vinegar is made from fermented coconut water and is used extensively as a preservative and fl avouring agent in pickles, salads, sauces and many other condiments. Coconut vinegar is also made from the sap of the coconut tree and is similar to the fresh coconut water. Naturally fermented coconut vinegar is rich in minerals and vitamins such as beta carotene, calcium, iron, magnesium, phosphorous, potassium and sodium. Raw, unfi ltered organic coconut vinegar is similar to the one that is fermented naturally. Coconut vinegar helps in digestion and improves the quality of cooked meat and fi sh. It is a healthier alternative to synthetic vinegar. It is a nourishing and refreshing healthy soft drink concentrate prepared by mixing coconut water, sugar and natural preservatives like lemon and ginger. It is rich in vitamins and minerals with low calorie. The product has a shelf life of three months under ambient conditions. 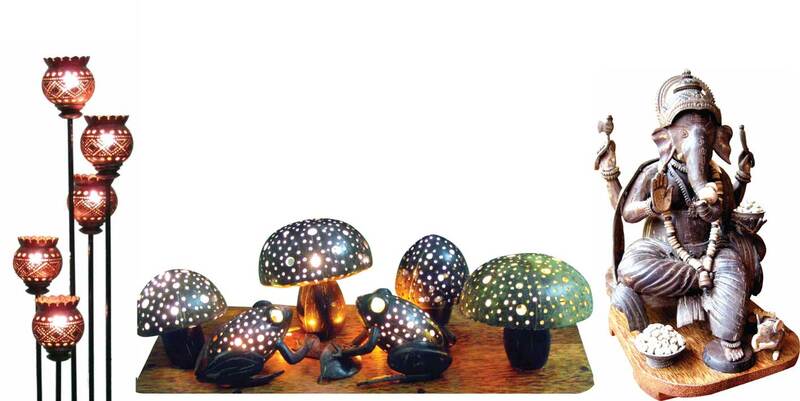 The product is a new item and is gaining popularity in Asia and Pacific countries. Nata-de-coco a cellulosic white to creamy yellow substance formed by acetobacter aceti subspecies Xylinium, on the surface of sugar enriched coconut water / coconut milk / plant extract / fruit juices or other waste materials rich in sugar. It is popularly used as a dessert. It is also used as an ingredient in food products, such as ice cream, fruit cocktails, etc. “Nata” is a Spanish word, derived from the latin word “Natare” meaning “to float”. 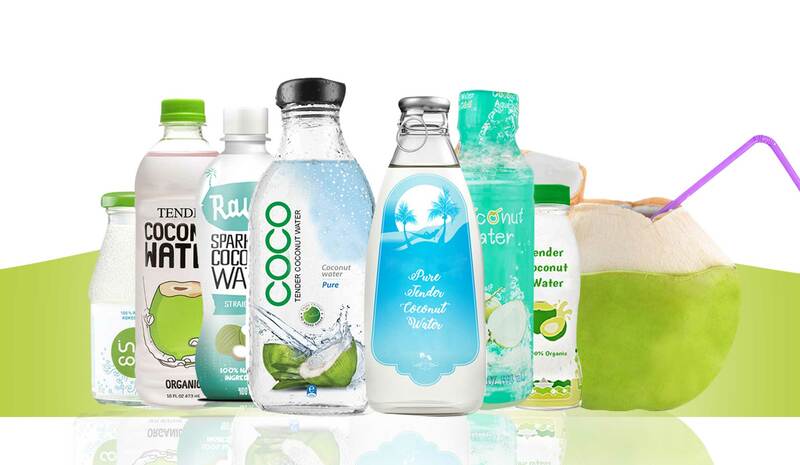 Nata making plays an important role in the development of our coconut industry because of the growing interest in its production from coconut water, an abundant waste product of coconut processing units. Nata can be prepared from various fruits like banana, pineapple, tomato etc. and the product named after the media used, like “Nata de coco” from coconut, “Nata de pina” from pineapple etc. We can also use coconut milk, finely shredded coconut meat or coconut water in preparing Nata. The vascular sap collected from immature unopened coconut inflorescence is popularly known as Neera in fresh form. It is a sugar containing juice and is a delicious health drink and a rich source of sugars, minerals and vitamins. It is sweet and oyster white in colour and translucent. It is tapped from the coconut inflorescence and is filtered, pasteurized and bio preservatives added to preserve the product. Treated Neera can be preserved in cans upto two months at room temperature. It can also be packed in tetra packs or glass bottles. Tapping can be done for six months in a year. It is an abundant source of minerals, 17 amino acids, vitamin C, broad spectrum B vitamins and has a nearly neutral pH. Fresh neera when boiled to 118-120o C and allowed to cool for solidification. The solid mass is known as coconut jaggery or ‘gur’. 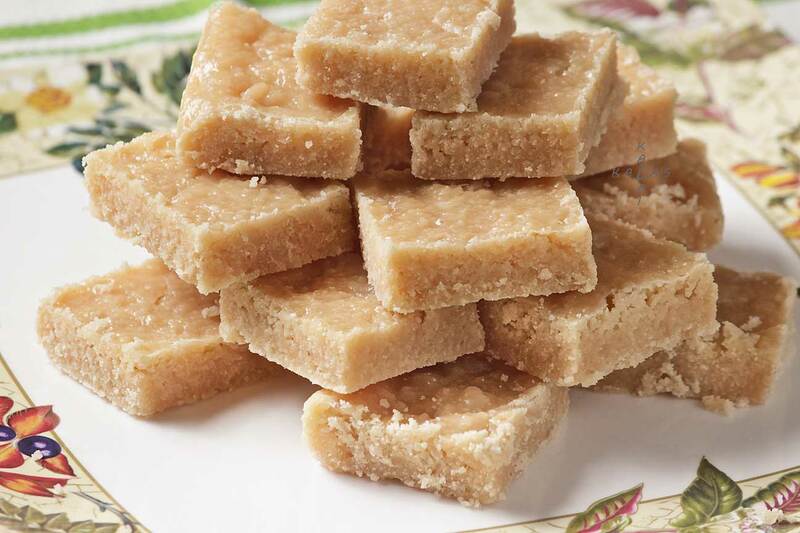 Coconut jaggery is made in traditional coconut growing tracts in the country on a cottage scale. Calcium and phosphorus are the important minerals contained in coconut jaggery. 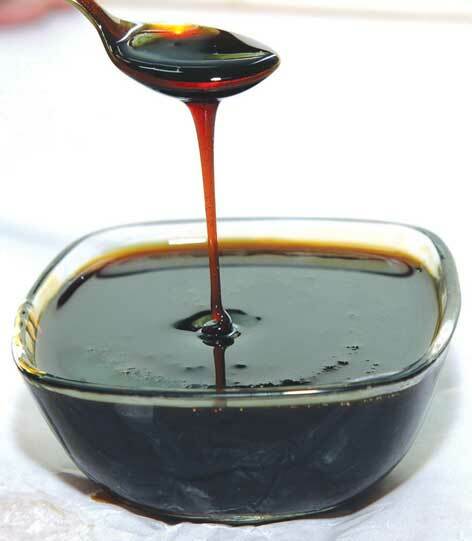 Treacle is another product manufactured from sweet toddy. It is obtained by boiling down the toddy. Fresh toddy is also a good source of baker’s yeast. The fresh neera rapidly ferments and the sugar is replaced by about 5-8 per cent alcohol, which on distillation yields arrack. Fermented neera on acetic fermentation yields vinegar containing 4-7% acetic acid. The coconut palm syrup or jaggery can be crystallized to produce fine granules of sugar. 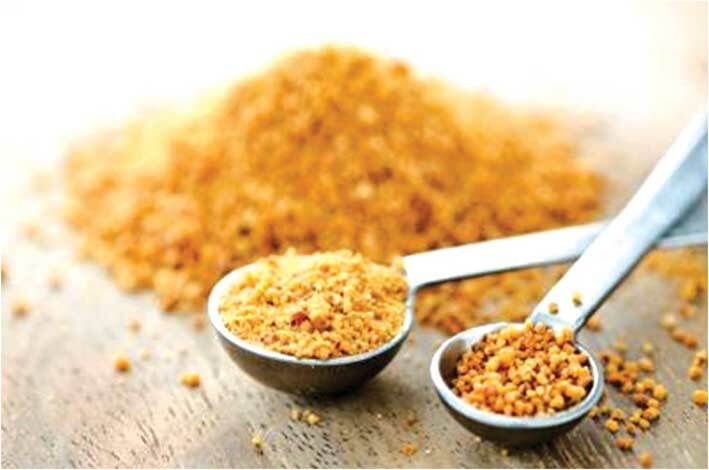 Transition of coconut jaggery into a ground granule sweetener is more accepted by global markets. The recovery of palm sugar from coconut palm jaggery is 15%. The application of this sugar is tremendous and offers huge potential owing to its most important health attributes, the low Glycemic index and the high nutrient content. It can be the most suited alternative sweetener, especially when agave sugar is being rejected owing to the high fructose content. This alternative sugar industry is estimated to be a $1.3 billion industry and hence the market prospects are enormous. This is a product similar to jaggery with high content of minerals. It is a rich source of potassium. It has good content of sodium and is free from total fats and cholesterol. It is produced when fresh Neera is heated and concentrated into syrup. The input output ratio is 6:1. The syrup has 50% sucrose content and possess low glycemic index at the levels of 35 GI which indicates that low levels of sugar gets absorbed into the blood thus making it safe for diabetic patients. Coconut biscuits are ready to eat snack products prepared from maida and coconut powder. It can be prepared in different varieties through addition of cocoa, butter; ginger etc. The product has a shelf life of three months under ambient conditions. It is mainly consumed as a snack item. Coconut biscuits are highly nutritious and delicious with low calories and high fiber content and is one of the healthiest snack items which is quite popular and is in great demand in Asia and Pacific countries, USA, European countries, Middle East and African countries. Coconut candy is prepared from grated coconut mixed with coconut milk. It has high fiber content and helps prevent intestinal sluggishness. 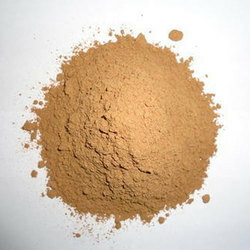 It is a newly introduced product mainly produced in Asia and Pacific Countries. It is a sweet confectionery item prepared from coconut gratings sugar, milk butter with a coating of chocolate. It is rich in protein, carbohydrate and fiber. It can be made more delicious through addition of cashew, badam and other dry fruits. The product has a shelf life of three months under refrigerated conditions. The product is having extensive demand in Europe, North America, Australia, Middle East and China. It is a snack prepared by roasting coconut gratings. A procedure for preparation of coconut burfi was standardized. Coconut gratings (after extraction of fat) were roasted, then added fat at the rate of three percent and sugar at ten percent gave highest organoleptic qualities. The product has good nutritive value with protein (10.23%), Ash (2.1%) and carbohydrates (60.87%). Coconut shells free from contamination of coir pith, etc., are broken into small pieces and fed into a pulveriser. The powder from the pulveriser is fed into a cyclone and the parallel product is collected in bag filters. The shell powder is then fed into a vibrating sieving machine and packed according to mesh size requirements for various end uses. The rejects from the sieving machine can be recycled in the pulverizer for size reduction. 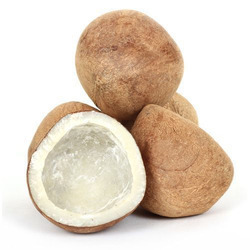 The main requirements for consistent good quality of coconut shell powder are proper selection of shell of proper stage of maturity and efficient machinery. Moisture 10 per cent max. Shell Charcoal is obtained by burning the shell of fully matured coconuts with a limited supply of air so that they do not burn away to ash but are only carbonized. The manufacture of shell charcoal shows from the coconut shell has become a very important economic and commercial activity. 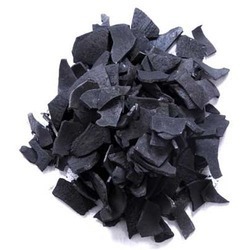 Furthermore, coconut shell charcoal, which was relatively a minor product in the past, has now developed into a general commercial commodity due to its intrinsic value as a raw material for the manufacture of activated carbon. Coconut shell charcoal are of two types: viz Coconut shell charcoal and granulated shell charcoal. Size Not more than 5%, shall passa 0.63 cm mesh sieve. The process of activation is carried out in two stages. Firstly the coconut shell is converted into shell charcoal by carbonization process which is usually carried out in mud-pits, brick kilns and metallic portable kilns. The coconut shell charcoal is activated by reaction with steam at a temperature of 900oC -1100oC under controlled atmosphere in a rotary kiln. 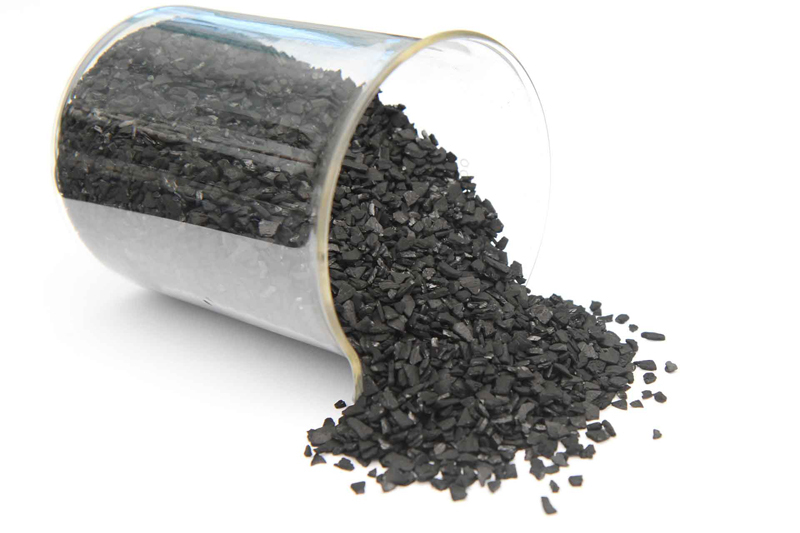 The reaction between steam and charcoal takes place at the internal surface area, creating more sites for adsorption. The temperature factor, in the process of activation is very important. Below 900oC the reaction becomes too slow and is very uneconomical. Above 1100°C the reaction becomes diffusion controlled and therefore takes place on the outer surface of the charcoal resulting in loss of charcoal.